Given Christian Bale's many modest disavowals about his acting career, it's a wonder what a solid and interesting career it's been. Bale had barely hit puberty when he starred in Steven Spielberg's Empire Of The Sun; his roles over the next decade were often smaller, but he generally stood out for his intensity and focus—especially as one of the few saving graces of the largely laughable musical Newsies. He re-established himself as a force to contend with bold roles in Velvet Goldmine and American Psycho, generic action-hero turns in Equilibrium and Reign Of Fire, and a stunning performance in The Machinist, where he stunned the media by losing a third of his body weight to play a tortured man in the midst of an emotional disintegration. He bulked up again to star in Batman Begins, and since then, he's taken on a series of striking projects—The Prestige, Rescue Dawn, The New World, and the new Western remake 3:10 To Yuma, now hitting theaters. While in Chicago filming the Batman Begins sequel The Dark Knight, Bale sat down with The A.V. Club to discuss adventures in filmmaking and career-planning. The A.V. Club: How did you get involved with 3:10 To Yuma? Christian Bale: I wanted to do a Western. And this was a very good one. And I was in a position where, having finished Batman Begins, I had a number of projects which I had been trying to get made before that, which suddenly became possible. These were like, Rescue Dawn, Harsh Times. And then it was, "Okay, let's look for something new." Really, I was just hoping that I would find something I didn't have to evaluate as something which had problems but with the right people could be worked out. I just want to find something that through and through intrigued me. 3:10 to Yuma was one that I just kept on talking and thinking about after reading it. And I think the reason is because, like in most Westerns, you have the very clear-cut bad-guy/good-guy, however, as the movie progresses, you kind of see that it's a very fine line that divides these two. And they're both actually people who speak the truth. They come to a mutual respect for one another because of that. They're the only people they know who just speak the plain truth to each other, and are uncompromising. So I found a lot of interesting questions inside of it, on top of the fact that this is your classic Western, horses, gunfights, which, you know, I like, and wanted to spend a few months getting dirty doing. AVC: Why did you want to do a Western in particular? CB: Well, I didn't say "I'm gonna go find a Western to make." I read the script, it was a Western, and I realized how much I would actually love to make a great Western. It seems strange—a lot of actors I've met since making 3:10 To Yuma say "Ah, damn, you got to make a Western." So I guess it is something that is very wanted. And I guess it's also because you don't get that many made, you know. There's not that many. AVC: They seem to be making a comeback lately. CB: Well, let's see, you know? 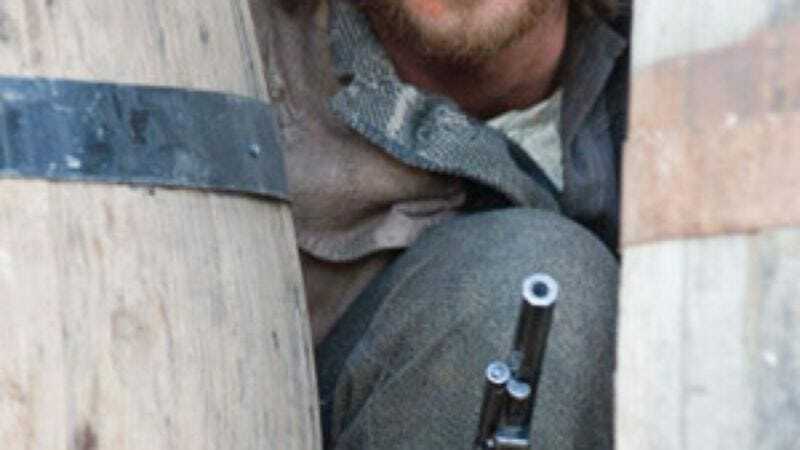 I guess we've got Jesse James coming out, and then that Coen brothers film, though that's contemporary. But you know, whether it comes back or not will depend on how they do. Certainly they come in cycles, don't they? The recent benchmark always seems to be Unforgiven, cause it's being considered sort of the best and most recent Western. Everything else is sort of measured against it. AVC: The male roles in Westerns tend to be very traditional, buttoned-down, serious roles. And a lot of your roles are like that—the man who doesn't give much away emotionally. Does something particular about that role appeal to you? CB: I don't ever really sit back and look at roles I've taken and look at any similarities. It's only when, you know, somebody like yourself who is analyzing it far more than I am brings something to my attention. Then I'll either agree or disagree. But I'll have to go away and take a look and even remember what different roles I've played. So what I mean is, I certainly don't intentionally do it. AVC: What do you look for in a role? CB: I think mostly it's the adventure that I will have in making the movie. That's what I look for. That's it. That's what is most satisfying to me. AVC: You've taken on a lot of roles with really rough shoots. You actively seek out roles that are going to be physically adventurous? CB: Yeah, for me, I think the harder the shoot, the more I feel like I'm enjoying myself. AVC: Does it bother you when people focus on that, though? It seemed like the Rescue Dawn interviews mostly focused on the snakes and the heat and the jungle where you shot it. The interviews for The Machinist all focused on the weight you lost for it. It seems like people talk more about the weight loss than the film. CB: That was a mistake which just was my lack of experience. In hindsight, I wouldn't have answered questions about that. Because I like The Machinist very much. And I think it deserves to be more than "that movie where that guy lost a whole bunch of weight." Of course, you know, that's the easy way to describe it. But it was featured far too much. After it happened, I realized "Oh God, I shouldn't have mentioned that." Consequently with Rescue Dawn, people asked me various questions on that, and I attempted to steer them back toward the movie as a whole, rather than any one particular point about the movie. Because otherwise, unfortunately, it could end up seeming like some kind of a gimmick. Yeah, that was unfortunate. And it does annoy me when I see that happening. AVC: But you look for what the shoot or the adventure is going to be like rather than what you think the final product will look like? CB: I think primarily, yeah. Because the final product is out of my hands, pretty much. I'm responsible for myself. The director is in charge: How we all come together, work together, there's so much stuff which is just not within my control. And not really within the director's control either. Sure, he's the guy trying to juggle all this together, but believe me, he's not able to absolutely dictate how it turns out. There's no way. So it's a wonderful thing when you get a movie that you actually go, "That was what I was hoping this could be." That's a hope in my mind, but I can be more certain about working with good people and getting myself into intriguing situations. Now, I'm not meaning that the adventure completely shadows the end result. There's no point in going on an adventure that you know is never going to be a movie worth watching. That's a waste of everybody's time. But what I mean is, you can try to do both. You mustn't blind yourself, what with wishing for an adventure, to the fact that you should be creating a watchable movie that will be beneficial for people's time and not waste it. But I think that the movie becomes better, the more of an adventure you have. AVC: What movies have been the biggest adventures for you? CB: There's a lot of different kinds. The most recent obvious adventurous one would be Rescue Dawn. You can see, "Hey, we're in the jungles of Thailand, I'm with Werner Herzog, I'm being dragged by buffalos, I'm falling down rapids, and flying over rooftops in helicopters." So all right, that's a very straightforward adventure. Others can be more of mental adventures. The Machinist would be one of those. Others can be new experiences for me. The Batman movies would be those. A very different kind of movie than I'm accustomed to. I do very much like when it's actually a physical adventure, like Rescue Dawn and 3:10 To Yuma. I just adored it when we were racing through on horses and firing guns and being out in the desert at nighttime when it was freezing, I like all of that stuff. The more cerebral adventure is just as enjoyable, but it's not always as evident to other people. AVC: Do you have difficulty finding roles that meet your requirements? Films that you think will be adventures, but that also turn out to have been worth making? CB: I certainly have, yeah. You go back and look, and you see a trail of disasters in my wake. AVC: What do you consider a disaster? CB: I always leave that for other people to decide, because some of the things I consider to be disasters are some people's favorite movies. And that's what I like so much, is that you never know. Something intrigues somebody and means nothing to somebody else. I don't like filmmakers to tell people how they should react to their movies. I absolutely have favorites, and I have others that I'm mortified by, but I keep that to myself. I think I've managed to find some very interesting things that I've been very satisfied with recently. I don't know if that's gonna keep going. AVC: What have you been happiest with in terms of seeing the film afterward, in terms of getting that "This is what I thought it could be" feeling? CB: I think that I've had an unusually fortunate—for myself, other people may disagree—run recently. I would say that from The Machinist on, I've been pretty happy with the way that most of the movies have turned out. And that's unusual. I don't believe it's because I'm lowering my standards. I think they really have turned out to be a nice surprise for me every time. It's always sort of gravy for me more than anything if the movie turns out well, but everything: Machinist, Batman Begins, New World, Harsh Times, Rescue Dawn, Prestige, now 3:10 To Yuma—they're all radically different movies, certainly not appealing to everybody. And probably you wouldn't get one other person who liked all of them, except for me. But I do. I do like them when I see them. AVC: You've said Batman Begins let you plan your career for the first time. CB: Yeah, to a degree. I'm not at the point yet where I'm truly able to do that. I was suddenly able to get financing for movies that I had been trying to get made for some time. They suddenly came together much easier after Batman Begins. So the plan is actually working. It meant I was able to be cast in movies that I think otherwise I would never have been cast in. Planning a career, I always find that such a tricky thing, because I don't have much of a plan, really. People always say, "What do you want to do next, what kind of movie do you want to do next?" And I say, "I wanna do whatever script that is the best one that comes my way." I certainly would never say, "Oh, I'm gonna do a Western next," and sit around waitin' for a Western to come along when there's some other genre's brilliant script sitting right there. No. And I don't have any desire to plan it that much. What has been quite nice is that for the first time ever, I sometimes have known what I was going to be doing next whilst I was working on something. I knew that I was going to be doing another movie, and when. Which had never happened to me before. It was always that I finished one movie and then had no idea what I was doing. I think there's a limited amount of planning you can do, at least in the position I'm in. Maybe more successful actors can plan more than I'm able to. AVC: You don't consider yourself a successful actor? CB: I ain't the first on the list that people are sending scripts to. I'm very lucky. I've managed to put myself in the position with some directors, yes, who will be calling me directly, and we're working on things and talking about things, but that's on a purely creative level. And then you go and have to deal with the financial level. In terms of financiers, in their eyes, no, I ain't the first on the list. That's how I mean "successful," in that respect. There are many actors who can probably absolutely plan their careers and really, really have the pick of the bunch. AVC: You've taken some roles that have been controversial. American Psycho and Velvet Goldmine were both described as potentially career-killing films, though for different reasons. CB: Really? On Velvet Goldmine? I never knew that. [Laughs.] I never got that sense. AVC: Have you ever taken a part that you thought would be risky to your career, that could make you less "successful," or bankable? CB: Nothing that I personally felt that way about. Though certainly, American Psycho, yes, I had a lot of people saying to me that it was a big risk. I never considered it to be, but I found it very funny that other people did. In a way, I had a kind of self-destructive bent, where I almost wanted to see if they were right. Like, "Really? This can actually have such an effect that I'll never work again? Well, I want to do that and see if that happens, you know?" But I've not been aware of that on any movie other than American Psycho. CB: No, no, no. I never applied to any acting schools. I don't know if that's just bad reporting, or—sometimes I just make stuff up. AVC: But you have said in some interviews that you've regretted not getting a formal education in your craft? AVC: Could you have learned anything from school that you haven't learned from the job? CB: Probably not. But I wasn't sure about that at the time. You know, there was a partial feeling of just wanting to have the experience that people of my age were having, who were going to college. Sure, I was working, and I was loving it. And I was getting to travel and stuff. But you know, I was paying bills, and I was having responsibilities that they didn't have yet. A certain amount of it was just wanting to shirk those. In terms of actually studying and stuff—I guess it's right for a lot of people, but I don't feel like you need to, for acting. I think there's a few very simple, easy rules for film acting—very simple directions, like getting off camera, eye-lines, sightlines—you can learn it in a day. And other than that, I've never quite seen the need for it. I recognize that's me personally. Some very great actors do like to train. But I'm just not interested in doing that to myself.